"This is an Australian recipe for yogurt salad dressing. 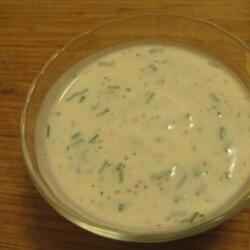 It can be used on potato salad, coleslaw or as a dressing on the side for grilled fish." In a small bowl, beat together yogurt and lemon juice until smooth. Stir in mustard, parsley, and chives. Refrigerate until ready to serve. This dressing is tangy with flavors of herbs. Mmm! I served this recipe at an Australian International dinner I was hosting and everyone found it to bee to hot from the mustard. Next time I would use less mustard or maybe try a milder variety! Quick and simple -- and refreshing blend of lemon and dijon flavours. Great for summer salads. wanted more lemony taste, so I added 50% more lemon and some grated lemon peel, but everyone thought it was delicious with shrimp. This is a perfect low fat option to the normal dressing and so simple to make.....highly recommended! Easy-peasy, and very delicious. I use regular, not fat free yoghurt, and it was so nice and creamy. For a low fat tartar sauce I added sweet pickle relish. I sneaked it by my tartar sauce lovin' daughter...turned out great, 'cuz she loved it! Delicious. Quick and Easy! I put on an arugula salad with grilled fish. Thank you for submitting it.